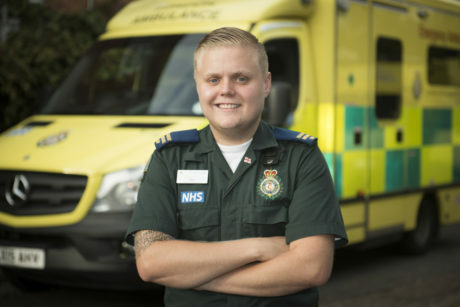 Sam started his London Ambulance Service career with our patient transport team, before becoming an Emergency Ambulance Crew. Not only does Sam help saves lives in north east London, he also volunteers his time to the RNLI. When I was at school I wanted to be a firefighter but then I did first aid training at a young age and began working at different events, which is how I started getting medical experience and it went from there. I first joined the Service doing patient transport journeys before moving to the control room to take 999 calls. I then became an emergency ambulance crew treating patients out on the road, which is what I’ve been doing for two years. I work 12 hour shifts and go to a wide range of incidents, from an elderly faller in Romford to a stabbing, or road traffic collision on the A12. I’m also trained to work as a single responder in a car so I do that every now and then. Working shifts also gives me time for my hobbies, which include working for the RNLI as a lifeboat crew. You work in north east London. What’s it like there? I grew up in the area so it’s nice to feel I’m putting something back and helping the community. I can sometimes go to patients who I know, which can be a shock to some people. It’s a great team here and everyone goes the extra mile to help you. It’s not as busy as central London, but you don’t have to fight through traffic. There are also plenty of training opportunities as I have done my training to work on a car and do a shift every now and then to keep my skills up. I have also done my training to transport very poorly babies to different hospitals. I would 100% recommend this job to anyone looking for a career. If you’re unsure if you want to commit the time and funds to go to university, you could join the same way I did and then work your way up.